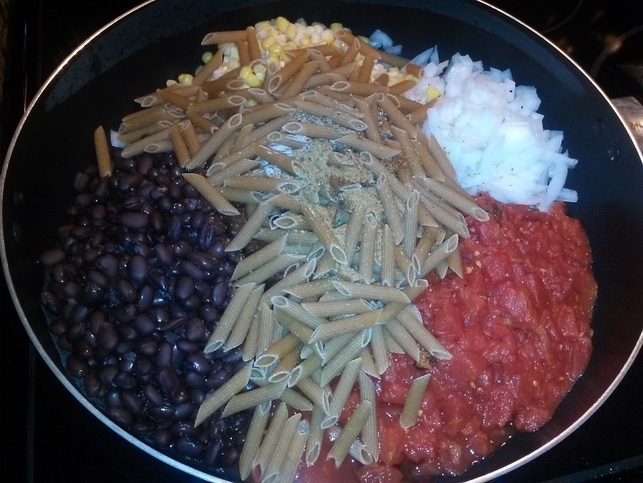 One Pot Pasta, Mexican Style. Use deep dish skillet, and simply put all ingredients in. Cover it all with vegetable broth, (i used a whole 32 oz. carton) maybe a bit more, add more if you need it, (you can drain off any excess liquid at end before serving).. and simply light boil for 7-9 min covered, stir, then 2-3 min uncovered until pasta is tender, stirring it a few times. Serve with low fat Tortillia Chips.